BEIJING (Reuters) - China has cut oil product export quotas to the nation's four oil majors by 40 percent in the first round of licences for 2017, according to two sources who have seen the documents, even as traders expect allowances for overseas sales to meet or exceed this year's record levels. 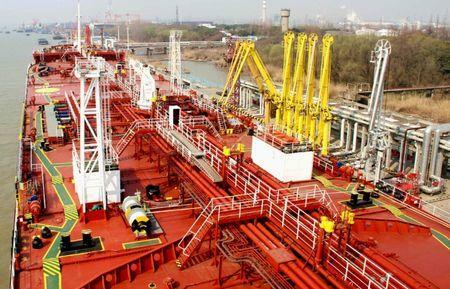 The notice did not include quotas for independent refiners, known as "teapots", in line with a report by Reuters earlier this month that the government has ditched the small refiners from its export program. In a notice dated Dec. 23, the Ministry of Commerce and the General Administration of Customs said the four state majors will be allowed to sell 12.4 million tonnes of gasoline, gasoil and jet fuel abroad next year. That's down from 20.54 million tonnes in the same round this year. "We expect the total quota for 2017 to be on par or a bit higher than 2016," the trader added. China issued allowances for a record 46.08 million tonnes of oil products in 2016, up 80 percent from 2015. In the first 11 months of the year, it exported 43 million tonnes of oil products - including products other than gasoline, gasoil and jet fuel - up 35 percent on a year earlier. The Ministry of Commerce has yet to comment. Independent refiners, known as "teapots", were not included in the list, a change from the first round this year when four independent refiners were granted quotas for the first time. Teapots account for only a fraction of China's fuel exports, but dropping them will hand the export business back to the majors and deal a blow to the small but fast growing group that has brought new competition to China's oil industry. With 6.05 million tonnes, Sinopec Corp <600028.SS> won about half of the total in the first round. Sinochem Group <600500.SS> did not receive any quota for jet fuel. Out of the three products, gasoil accounted for 5.25 million tonnes, 42 percent of the total allotted to the four majors; gasoline for 3.65 million tonnes, 30 percent of the total, and jet fuel with 3.5 million tonnes made up the remaining 28 percent.